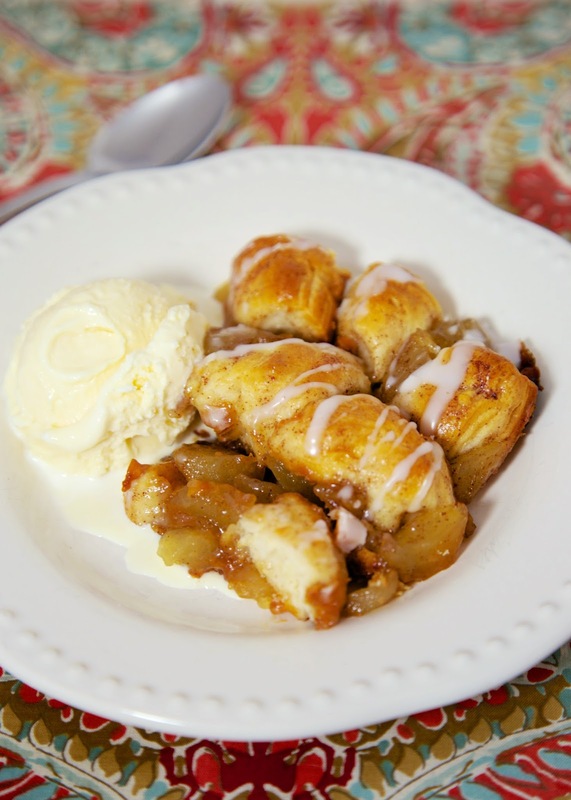 Apple Pie Bubble Up- a sweet version of our favorite bubble up recipes! 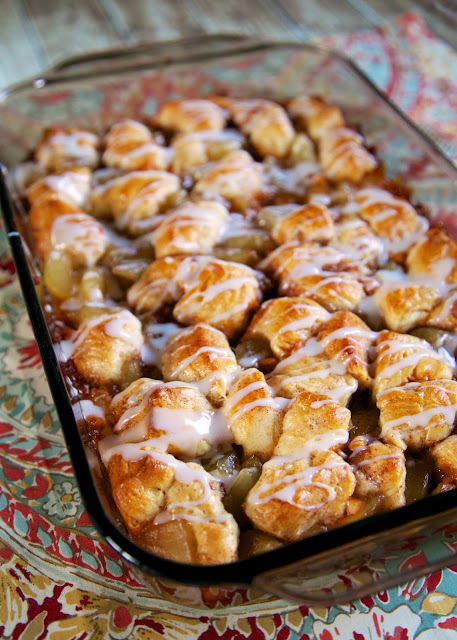 Made with apple pie filling, Pillsbury biscuits and butterscotch chips. Great holiday dessert! I've made a ton of Bubble Up recipes on the blog. I love them all. This is the first sweet bubble up! The recipe came from Plain Chicken reader, Jenny. She sent me this idea forever ago and I finally got around to making it. One word - YUM! We loved this sweet bubble up. We especially loved it heated with some vanilla ice cream. Jenny's recipe had some brown sugar and pecans in it. I would have add that to my recipe as well, but I didn't reread the recipe before I made it. If you are a fan of the savory Bubble Ups on the blog, give this sweet version a try! You will love it! In a large bowl combine apple pie filling, cinnamon and butterscotch chips. Using a spatula, chop up apple slices into bite-sized pieces. Cut biscuits into 4 pieces. Stir into apple mixture. Pour into prepared pan and bake 25-30 minutes. Combine powdered sugar and milk. Drizzle over baked casserole. I love seeing all your bubble up recipes but I may actually try this one. It looks scrumptious!! Would you please share how to add the brown sugar & pecans too? Yum! Can't wait to try this one!!! I second it! I love adding pecans to desserts. I wouldn't mind having those directions as well. I think I'll make this for our "picnic potluck" this evening! Think this would work with a can of cinnamon rolls instead of the biscuits? I can't wait to make this! Cinnamon rolls would work great. Almost used them in this but didn't have any in the fridge. What do the butterscotch chips add to the flavour. I'm not really a fan of butterscotch. I can't wait to make this! I will probably add the pecans and brown sugar on top before baking. This was delicious! I've made a bunch of your bubble ups, but this was the first dessert I've tried like this. Thanks!